IK provide some input to music makers on Android. 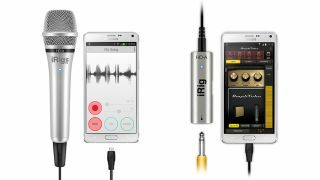 The recent releases of iRig HD-A and iRig Mic HD-A bring guitar and microphone input to Android users, tipping the scales - at least a little - from the dominant iOS platform towards users of Samsung devices. In early October, Samsung announced its Professional Audio system, bringing better music-making potential to its devices. IK didn't waste any time jumping on board, porting their iOS amp modelling software Amplitube to Android, and releasing the iRig HD-A for guitarists to plug into their devices. It's worth saying at this point that Samsung's Professional Audio system, which facilitates the smooth running of the actual performance, is only currently available on their Galaxy Note 4 and Note Edge devices. More are said to be gaining support for the system soon. The Professional Audio framework seems to be able to allow music apps to communicate with each other, potentially similar to Apple's Inter-app Audio abilities. The iRig HD-A (€79.99) is an Android version of IK's existing portable guitar interface for iOS. It offers a 24-bit/48kHz A/D converter, a direct high-impedance input for guitars or other instruments, and direct connection to the device via an OTG cable, and an additional USB cable is also available for use with PC). You can use the iRig HD-A with any Android device which accepts an OTG USB input, though the Samsung Professional Audio-supporting devices mentioned earlier should suffer from far less latency, meaning that you'll hear what you play can back from the device with far less lag. Hot on the heels of IK's guitar interface, the Android-enbaled iRig Mic HD-A (€99.99) takes on recording duties. It's a condenser mic with built-in preamp and converter with a sample rate up to 48kHz. It's got an onboard gain control, and it'd connectible via OTG USB or standard USB for hooking it up to your PC. To demonstrate their hardware's relevance, IK released a version of their guitar amp sim AmpliTube along with the iRig HD-A. Following up on the same bent with the release of iRig Mic HD-A, they've announced a port of their EZ Voice app made especially for Android. A purchase of the iRig HD-A comes with AmpliTube Free for Android, as well as AmpliTube CS and AmpliTube Metal software for PC; getting iRig Mic HD-A nets you EZ Voice Free, iRig Recorder Free and Amplitube Free for Android (if that's any real advantage to you), as well as AmpliTube CS and the T-RackS CS mixing/mastering software for PC. IK's CS (Custom Shop) software contains a bare-bones version that can be supplemented by additional in-app purchases… just so you know.